Daniel Burke, the former CEO of Capital Cities/ABC and the man who brought the Sea Dogs to Portland, died Wednesday from complications of Type 1 diabetes, his family said. He was 82. Burke owned the popular minor league baseball team from its inception in 1994 and helped the club become an affiliate of the Boston Red Sox in 2002. Last year, he passed on the team chairmanship to his son Bill Burke, a Cape Elizabeth resident. Burke’s daughter, Sally McNamara, became the organization’s treasurer. Burke spent most of his business career helping Capital Cities, a small company in Albany, N.Y., grow from a handful of TV stations to become a broadcasting and publishing giant. In 1986, Capital Cities Chairman Tom Murphy and Burke, its president and chief executive, engineered the then-stunning purchase of the ABC network for $3.5 billion. Burke retired as president and chief executive of Capital Cities/ABC in February 1994, a month before his Sea Dogs began their first spring training in Florida. Burke, a resident of Rye, N.Y., spent summers at Kennebunk Beach for more than 50 years. When he bought the Eastern League team for Portland, he did not run the organization. He gave that task to Charlie Eshbach, once the league’s commissioner, who took over as Sea Dogs president and general manager. The Sea Dogs franchise had success before a pitch was thrown. Its catchy logo, with a menacing seal holding a bat in its mouth, became a hit. Sea Dogs merchandise was one of the leading sellers among minor league teams, even before the team began playing games. On opening day, April 18, 1994, Burke’s entertainment ties were evident. Kathie Lee Gifford, then co-host of the “Live with Regis and Kathie Lee” television show, and her husband, sportscaster Frank Gifford, took part in a pre-game parade. Kathie Lee Gifford sang the national anthem, and ABC sportscaster Chris Schenkel emceed the pre-game festivities. A sellout crowd of 6,274 fans at a reconstructed Hadlock Field watched the Sea Dogs lose 7-6. But those fans returned, and the Sea Dogs led the Eastern League in attendance. Later in the season, a “Barbara Day” promotion featured appearances by Barbara Walters and former first lady Barbara Bush. George H.W. Bush and Barbara Bush, summer residents of Kennebunkport, were friends of the Burke family, and were annual visitors to Hadlock Field. The late ABC News anchorman Peter Jennings also watched games at Hadlock, and even took part in a Sea Dogs batting practice in a Portland uniform. In 1995, Burke received national attention when ABC sportscaster Al Michaels suggested before the World Series that Burke should be named commissioner of Major League Baseball. In fact, Burke’s name had surfaced as a candidate for commissioner during his days as CEO of Capital Cities/ABC. But once he retired, Burke said, he could not imagine taking the commissioner’s job. As owner of the Sea Dogs, Burke watched his franchise become wildly successful. And as crowds grew, he kept expanding Hadlock. Low ticket prices, clever promotions and Slugger the Sea Dog mascot continued to draw fans. One tradition at the games was the Burkes – Dan and his wife, Bunny – leaving their seats next to the Sea Dogs dugout during the game and walking up to the owners’ skybox. On the way, they shook hands and greeted well-wishers. The Burkes supported the players, including holding an annual lobster bake at the Burkes’ home in Kennebunkport. George and Barbara Bush often attended. Once, a story leaked out that the fiance of a player, John Roskos, had lost her engagement ring. Quietly, the couple received a new ring – a gift from the Burkes. On the field, the Sea Dogs, an affiliate of the expansion Florida Marlins, reached the playoffs occasionally but never won the league championship. When Marlins owner John Henry sold that team so he could buy the Boston Red Sox in 2002, the Sea Dogs franchise soon made a dramatic change. 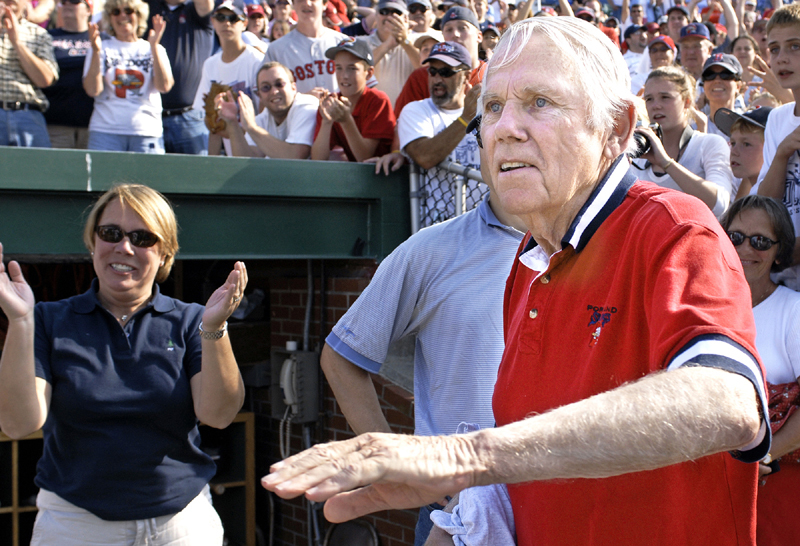 On May 23, 2002, Burke welcomed Henry and Red Sox co-owner Tom Werner to Hadlock Field for a game on a sunny afternoon. At the time, the Red Sox’s Class AA team was in Trenton, N.J. The lure of putting Boston’s minor league team in New England, and Henry’s familiarity with Burke and the Sea Dogs, had an inevitable conclusion: On Sept. 18, 2002, the Sea Dogs ended their nine-year union with the Marlins and announced a new affiliation with the Red Sox. Attendance continued to climb, as Sea Dogs and Red Sox fans filed into Hadlock. The New England Sports Network televised at least one game each season. Portland’s relationship with the Red Sox appeared threatened when an Eastern League team moved to Manchester, N.H., in 2003. The New Hampshire Fisher Cats were owned by Drew Weber, who also owns the Lowell Spinners, a lower-level minor league affiliate of the Red Sox. Hope was expressed in the New Hampshire media that Weber might attract the Red Sox’s Eastern League team from Portland to Manchester. In response to the Sea Dogs’ concerns, the Red Sox, in 2004, extended their agreement with Portland for four more years. They have continued to extend the contract, with the current agreement running through 2014. “There is no place else we would rather be, or we could imagine being,” said Theo Epstein, Boston’s general manager at the time. Cherington, who was named to replace Epstein as general manager Tuesday, was the team’s director of player personnel in 2004, working closely with the minor league teams. He said Burke was the ideal owner because he understood the needs of both Portland and Boston. “It’s about player development, and he gets it,” Cherington said. When Weber sold the New Hampshire team to Arthur Solomon in 2005, the new owner made public statements about trying to woo the Red Sox as an affiliate. Cherington quickly squashed that idea. The Sea Dogs won their first Eastern League championship in 2006, but the year was a difficult one for Burke. He injured both of his shoulders and broke a hip in a series of falls before the season. For the first time, he missed the season opener in Portland. When Burke did make it to Hadlock, he rarely sat by the dugout, instead staying in the skybox. He initially needed a walker, but eventually switched to a cane. In recent years, Burke became less visible. He was confined to a wheelchair. The owners’ seats were usually occupied by Bunny and her children and grandchildren – until Bunny made the walk up to the box during the game. But Burke still enjoyed watching the games, still enjoyed the baseball. Back in 1996, he talked about his baseball team, and how it instantly became an attraction in Portland. The Los Angeles Times contributed to this report.